Escrito el 27th Febrero 2018. The Pitch gives filmmakers the opportunity to pitch their next short film idea to an expert jury panel for the chance to win €5000 towards the film’s production and broadcast on TVCortos around the world. TVCortos has been hosting The Pitch in Cannes and at other film festivals around the world for more than five years. In that time, we have seen hundreds of filmmakers compete for the grand prize, including Oscar nominated Dutch animators Job, Joris and Marieke and award winning Icelandic filmmaker, Eva Sigurdardottir. This year we introduced a twist to the competition. To be eligible to enter, filmmakers had to not only have a great short film idea but also be able to submit a fully formed script and budget for the film. We received over 100 entries from around the world and the quality of entries was extremely high. TVCortos selected 20 of the best scripts and asked their filmmakers to come pitch to us at the Cannes Film Festival in May, 2018. They each had 1 minute to pitch their idea to camera and the 5 best filmmakers (judged on both script and pitch) made it through to our live final. The final took place at the BFI UK Pavilion in front of an audience and jury of experts. This year our jury included TVCortos’s Head of Production, Stephanie Charmail, Benoit Blanchard from UniFrance and Maria Kivinen from yle, the Finnish Broadcasting Company. Our finalists were Bobby B. Grubic from the US, JB Minerva from Mexico, Lucy Linger from the UK, Shirleen Wangari Kiura from Kenya and Vanessa Pellegrin from the UK. 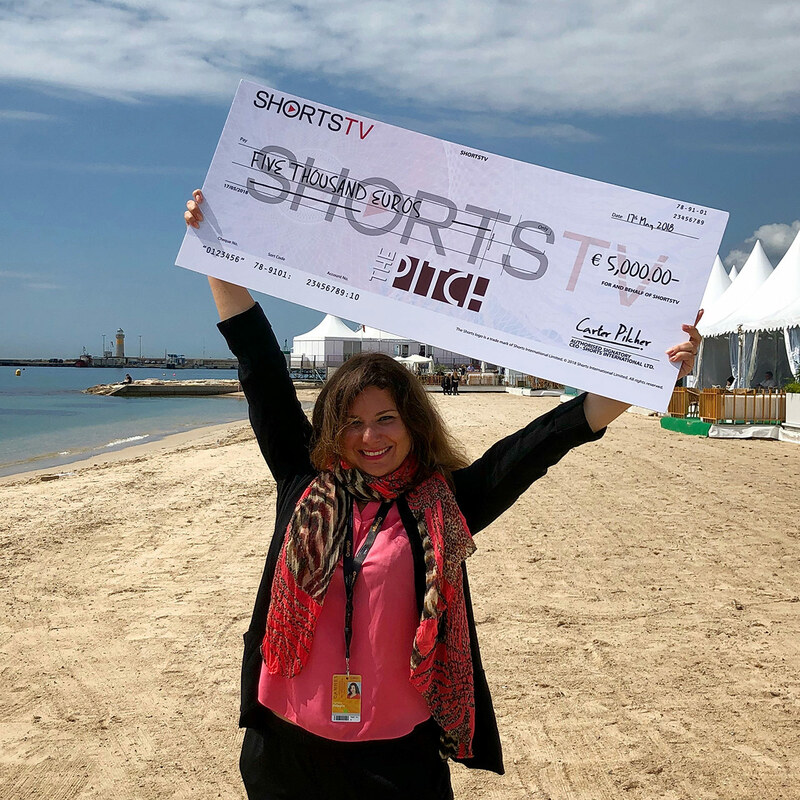 In the end, it was Vanessa Pellegrin who won the day with her short film script, ‘Sieda’, about a 76 year old women who visits her beloved husband at the cemetery where she unexpectedly meets an Irish widower and falls in love with him. The story is based on true events and Vanessa won €5000 from TVCortos to bring the story back to life on screen. She has only four months to complete her movie with the help of TVCortos’s production team! Well done Vanessa and good luck with the shoot! The finished movie will be screened on TVCortos so stay tuned – we can’t wait to see it! Find out how to enter The Pitch at the Netherlands Film Festival 2018!